In 1996 we did not take a holiday 'in the sun' and after a dismal start to the winter we fancied some sunshine so booked a two week late winter sun holiday to Tenerife. We chose Tenerife because we felt there was a better chance of warm sunny weather in early March. We were not disappointed. We flew from Luton with Monarch Airlines - be sure to mention at the time of booking that you use a wheelchair and need help with boarding. We narrowly averted problems by only doing this some 10 days before take off because we had not realised you could reserve your seat at the time of booking. 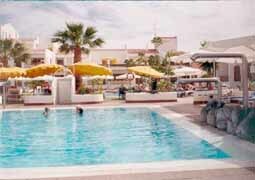 Mar-y-Sol, situated in Los Christianos, was our chosen destination. This 'hotel' is specially built for the disabled and is frequently advertised in the Spinal Injuries Association newsletter, so SIA members will be familiar with it. 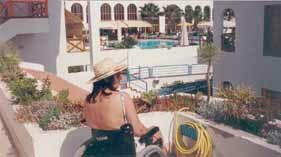 On arrival at Tenerife, we opted to be met by Mar-y-Sol's wheelchair accessible mini bus. The room initially allocated to us was a bit grim. Whilst being wheelchair friendly, as you would expect at this hotel, it had no view because the only window faced a brick wall. The tiles were falling off in the bathroom and the coffee table was broken. We complained and were moved 3 days later when an acceptable room became available. Aids, (monkey pole, toilet seats, etc.) can be hired and are best done in advance. You may be told that these things can be hired once you arrive but we found that this was not strictly true. You may have to wait for a few days for an item that suits you to become available. So book your requirements early. We liked the pool area, even though it was marred slightly by unfinished building work. The heated pool, with its easy access steps and hoist, was gorgeous. There were two other pools, one kiddies and one unheated, but I wasn't interested in those ! We had been told to expect adequate but stodgy food from the on site restaurant so we were pleasantly surprised as it was better than led to believe. We had paid for half board and it was possible, with notice, to swap the evening meal for lunch and go out on the town where there is an excellent choice of entertainment and restaurants. Unfortunately Mar-y-Sol is situated up hill from the town so whilst going 'down town' is easy, coming back is a bit of a push. Once in town the area is generally flat and wheelchair friendly and you can walk/wheel along the sea front all the way to Los Americas without encountering problems. We hired a car for several days and drove around the island. Mount Teide is well worth a visit, the scenery is dramatic to say the least (remember the Planet Of the Apes ?) Puerto del La Cruz and the Loro Parque. are also worth a visit. Whilst at Loro Parque, we noticed there were toilets for the disabled but they were more suited to the ambulant rather than wheelchair users. Parque Ecologico in Las Aguilas Del Teide (not far from Los Christianos) is also an excellent day out, though there are some steep inclines. The really good thing about Tenerife is the short flying time, only 4 hours, and no time difference. The weather is a big plus, although they do also get cool and cloudy weather. We were fortunate and had a sunny, rain free, enjoyable two weeks.